I don't mean to seem unappreciative of this years plunder, but would you/could you please put this at the top of my Wish List for Christmas 2010? 1) Miniature hair-dryer to coiffure her hair. 2) Selection of lipsticks for that kiss-me-quick look. 3) Eyebrow pencil for that sultry look. Oh fun -- but this would only work for me if there was a stylist on the other end! Perfect! 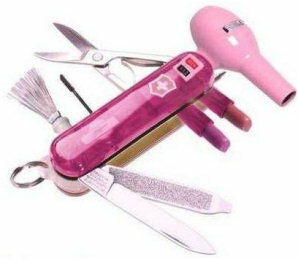 I can see this being the "must have" gift of 2010.